Have you ever dreamed of being a tiler? In Spain? In an Alhambra? 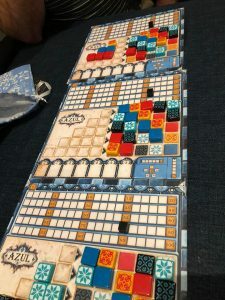 Well if the answer is yes, you really need to listen to this weeks episode as the Dice Men discuss the hottest of hot games, Azul. But if tiling isn’t your thing, maybe it’s being a mayor, or a villager or even a werewolf is! Leon talks us through his newest, favouritist game that uses words and things, Werewords. Finally, the countdown is on to Bordercon 2018! We talk about what we WANT to play, what we NEED to play and how there may be a surprise next week (as there won’t be an episode)! Thanks to Area 52 for their love and support!